"After a lifetime of feeling empathy for helpless creatures and striving to protect and sometimes rescue them, I've discovered there's merit in helping others to see them as I do, as worthy and feeling souls with charm and personality. By sculpting them using paper clay as my medium, I endeavor to capture and celebrate their grace, humor, playfulness, unconditional love, and sheer joy. "These colorful ceramic characters hopefully bring a surprise and a smile to anyone who meets them. Each one tells his or her own story and has a spirited, impish personality, smiling inside and out. I know that story, decide which animal best fits into it, then begin. Most subjects change and evolve as I create, and at some point I almost feel like one with my new friend. Being a lover of flowers, fashion, style and color, I put “the devil in the details”. My glazes are inspired by the beautiful natural color combinations in nature." 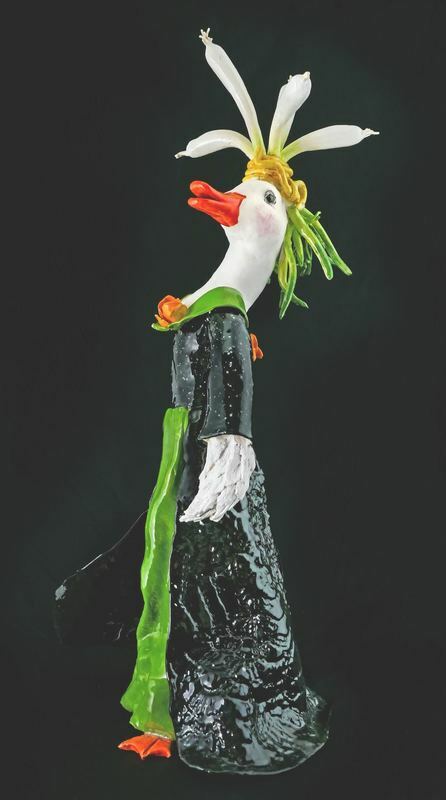 Jean's clay fashion animal sculptures are inspired by her love and passion for animals. She has been committed to all forms of animal work, particularly with greyhound rescue, feral cat trapping and sterilization, fostering kittens for North Carolina's Blue Ridge Humane Society, where she is a very active Board of Directors member. she would sit for hours shaping clay bakery goods, patiently and individually rolling each cherry in the make-believe pies before covering them with simulated lattice crusts. Thus, passion for fine detail was born at an early age. of beauty, color and lighting served her well in completing interior design assignments over the last 35 years, working for several firms and finally her own in Kansas City. There, with daughter Jill Tran, she also founded a lamp company, designing, producing, and selling their unique creations to retailers like Nordstrom and Roche Bobois. It was while exhibiting them at the High Point Design Market that she met her future husband Don. Jean now lives and works in North Carolina, dividing her time between custom interior installations through Asheville's Greeson & Fast Design and her own ceramics workshop at her home in Hendersonville.